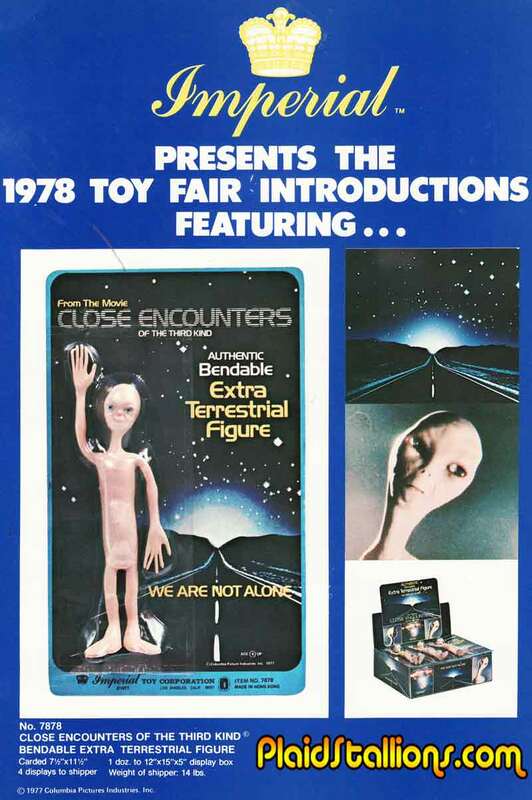 Despite the popularity of Star Wars, the Close Encounters license was only lightly picked up by toy manufacturers. Imperial produced the only thing that can be considered an "action figure" in this pleasant looking bendy. I can't speak for everybody but these didn't sell, at all, where i lived. I stared at this display box at my local "Dominion Playworld" until the early 1980s, where it sat, next to the army of unsold Mego Mr. Mxyzptlk dolls. When E.T. came out and there was a shortage of any kind of action figure for that property, these re-emerged from hiding. I know that's when I ended up with one. Apart from the movie itself, this little weirdo is what I think of every single time I think about Close Encounters or when that movie is mentioned. I was seven and the impression I got from the poster with the eerie light down that highway at night was that it was a scary movie (I think the TV spots made it seem like that, too)...and seeing these figures in a display at the checkout at my local Zellers (Shoppers World on Danforth), they were sufficiently creepy enough to make me not want one. I've since grown to like the movie but I still don't want one of these weirdos. I find it interesting that they made both brown and blue-eyed versions of these. That's how I could distinguish mine from my sister's. We got ours at a Toys R Us on sale, just as the store was about to close for the night. They slept in my sister's doll bed and sometimes my real bed with arms folded neatly over the sheets. We played with them until their arm wires eventually broke. Definitely got our moneys worth. No surprises these didn't sell. First, Close Encounters wasn't remotely Star Wars. Families expecting a fast-paced space opera were treated to a plodding story heavily influenced by the director's own traumatic childhood and dysfunctional upbringing. Second, the aliens are almost never seen except at the end and then only briefly. When they finally arrive as a delegation, they don't really -do- anything. They show up, formally take on some human passengers and leave. Likewise with the ships themselves. A few glimpses of blurred lights here and there occasionally during the film, (much like a hypothetically "real" UFO sighting) and the audience was back to another half an hour or so of watching ordinary folks -talking- about it. And talking. And talking. And talking. All the spectacular shots that turns up on Google Image Search happen right at the very end of the movie. 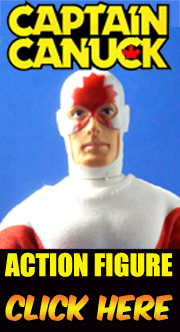 Third, as a toy concept, bendies were out and articulated action figures were in. Waving "hi" was out and accessory blasters were in. Aliens weren't visitors to earth. They hung out in a cantina, got drunk and picked fights. These bendies weren't sized right for interacting with Kenner-scale figures, vehicles, playsets. Fourth, and this is something no kid (or parent) wanted to dwell on for very long, the one extended "encounter" with the aliens early in the film was a nightmare. Start to finish, that scene struck viscerally at -everyone- in the family. For kids, the aliens were the monsters behind every closet door, the monsters under the bed. They crawled around down your chimney and up the air ducts in your home. They were the creepy noises in the ceiling and the sly, furtive sounds behind the walls. Appliances and toys sprang violently to life. No amount of little Barry Guiler's giggling and shrieking at what was happening in the house changed the terrifying atmosphere. It's been an open secret Spielberg directed Poltergeist. Long he ventured into the outright supernatural, he cut his teeth with this kind of horror in Close Encounters. This Anon saw Close Encounters for the first time on TV (fortunately) when I was much older. Even then, I was still young enough to realize it would have scared the hell out of me a few years earlier. For parents, it was worse and that's something you discover only as you get older. The aliens embodied every parent's worst nightmare: the kidnapper out to get their childen. Close Encounters was released at a time when missing children were becoming a highly-publicized national concern. The motives for stranger-abductions had changed over the years from ransom to something utterly unspeakable. Kids don't like being scared by alien boogeymen and parents don't like the idea of alien weirdos taking a predatory interest in their children. I believe and it's pure speculation, the general fear created by that "encounter" scene put a serious dent in sales. In terms of movie-making it's a long, disturbing and very effective five minutes worth of footage. Re-watching it for this comment, I'd forgotten how much the audio really sets the whole thing on edge. Don't remember ever seeing any products for that movie, other than the Marvel Comics adaptation. Just not a merchandise-friendly concept. You know if the molds are still around they could reissue them as a History Channel's 'Ancient Aliens' tie-in!!! I think Anon and Mr. Murtanovski nailed it here. CEotTK wasn't a horror movie but still I swear these are some of the most creepy aliens put on film IMHO. Frankly, I find the pop culture 'greys' pretty silly but these guys are just disturbing, not sure why but even now they freak me out. Gamera977 raised an interesting point about Close Encounters. It "wasn't a horror movie but still I swear these are some of the most creepy aliens put on film IMHO." Spielberg has a gift for doing creepy better than anyone, especially when it "wasn't a horror movie but..." Just look at Jaws and Raiders Of The Lost Ark. To make matters worse, the director always manages, quite mysteriously, to convince the MPAA his movie falls short of an "R" rating. When Mr. Spielberg is done talking, the MPAA says, "Not a problem, Steve-O. We're looking at a PG movie." My 10-year-old nephew loves that bendable alien. It's one of the first toys he grabs when he enters my house. It doesn't scare him at all. I bought this for a friends birthday present in 1978, from a department store in Corner Brook, Newfoundland. I remember it clearly because I was late to the party and I randomly chose this! I was 8 years old at the time.